Yesterday I had a rest… a little over six hours last week may not seem like much but the Saturday-Sunday back to back bike sessions finished me off. I did a small project in the spare time I had. 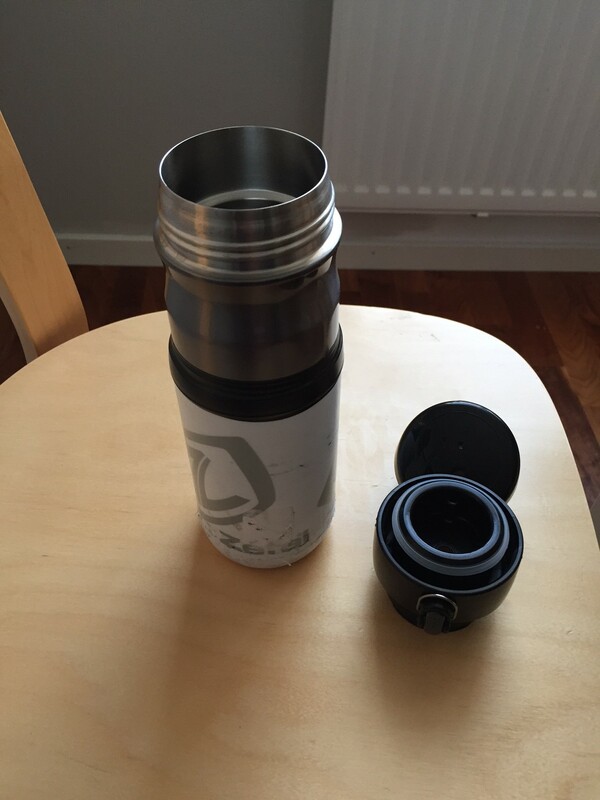 Bought a thermos flask, cut the top off an old water bottle and put the two together. 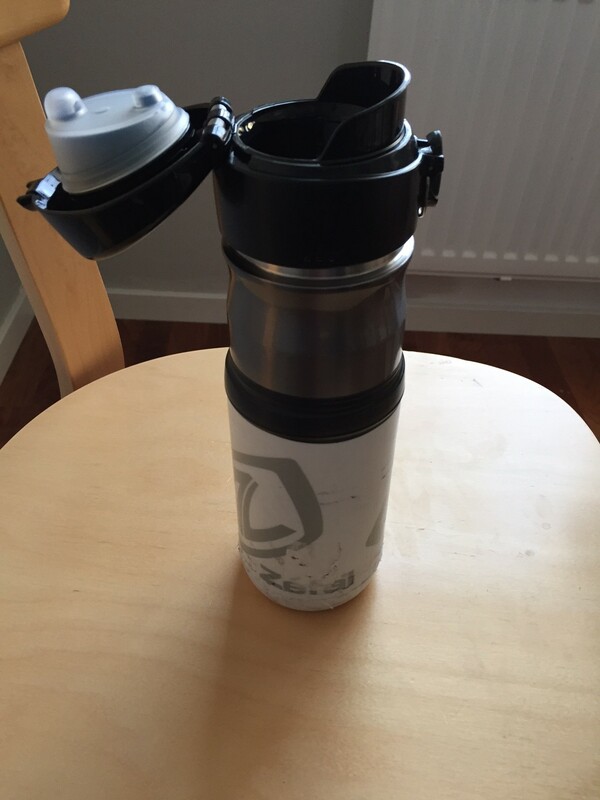 Now I have a warm drink bottle that will fit in the bottle cage. Saturday morning is forecast to be -5 C so I can give it a test then. Today I will most likely do an FTP test. I should nearly plan for this eventuality in the future: Sick in February. At least this year it’s not so bad. I’d say I’ll be four days without training. I ran on Saturday – a lovely run around Brunsviken and felt strange – when I got home I downloaded my data and saw that pace was down, HR was up; That was the virus incubating inside me. I could probably train today but I will not. Chest is sore and I don’t particularly want to complicate my life by training with a chest infection. I resisted the urge to train today. I really wanted to do something but felt that I should ease into the regular training – even though I’m taking it very easy at the moment. I will most likely MTB + swim tomorrow, row and run on Thursday and then rest on Friday. That’s the plan for the moment anyway. No pain this morning… well, that’s a lie. I had major pain in my shoulders from the strength training set yesterday. The foot though is great; not even the slightest sensation. To celebrate I was going to go out and run again but I will rest instead and take it tomorrow. Sauna is on and I’ll take a beer afterwards. The symptoms of my cold are still getting worse. Today my ears are blocked. Sore throat, runny nose, blocked ears. So that means I can run on Saturday if my symptoms are gone. It’s now 21:00 and I somehow feel the cold has past it’s peak. Tomorrow is another day and will tell more. I’m drinking a concoction of fresh lime, ginger, honey and camomile tea and am about to jump into the sauna. If I run on Saturday it will be my first run in 10 days… not good but better than not running at all. I’ve been over-reaching for a number of days now… time to back off for a while. Tonight’s SCT swim set is my absolute favourite; As many 400s as can be done in the hour. Sense is telling me to leave it alone. I will listen! The plan didn’t work out. No running at all this week; that is probably not a very bad thing but it needs to be addressed. This week will have three runs, two Turbo sessions and at lest two swims. Over 8 hours is the goal. Started in sunshine and finished in snow. Ended up off-road on Ice for about 500m – I think this slowed the average somewhat. It was very easy up to 20-22km; then it got a progressively difficult. I was thinking during my long run; what else is there to do? I have never been running these distances so far out from a marathon… this leaves me room to try something new. Not revolutionary new to the field of marathon training or the study of human physiology, new to me. Different to what ‘works’. I used ‘works’ because maybe there is something better. Maybe it doesn’t work! So, the thoughts that floated around were two different ideas. 1/ Go LONG. I usually cap the training at 32km – never going longer. Why not do a 35km run? In a marathon I usually start to fall apart at km 28-30. If I ran longer distances in training would this change? Or – is it the pace? which brings me to idea #2. 2/ Run Significantly more at M-Pace. Perhaps take a full week running 10-15km per day at planned M-Pace. Is this just looking for a injury or is it looking for an edge? Perhaps there is something in 1 & 2, perhaps it’s obvious. Perhaps it’s just a different way of saying TRAIN MORE. Perhaps it’s the madness that is music free running; too much time to think. Relative to my training so far this year, I had a solid week’s training. My first time on the skis didn’t help much. Today I feel like I have been run down by a steamroller. I had a chance to train but turned it down. My poor performance on the bike yesterday made resting a good call. Tomorrow will be a double. Bike and either swim or run. Still feeling the effects of Tuesday’s bike session – I’ll rest today.